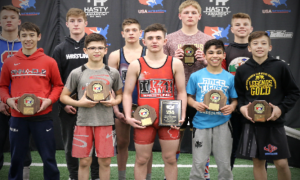 A few of the more notable names on the Junior level took home titles yesterday at the Junior Greco World Team Trials yesterday in Las Vegas. 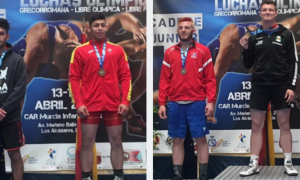 Three-time Cadet World Team member Taylor LaMont (Champions Wrestling Club) faced off with Minnesota Storm rival Mitchell McKee in the finals at 60 kg. 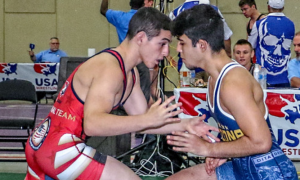 These two have locked horns more than a few times before, and have even competed against each other in both folkstyle and freestyle. Their series had been sort of a back-and-forth epic leading in, but the drama that normally surrounds their meetings wasn’t there in Vegas. LaMont pinned McKee twice in a row to sweep the best-of-three and make the World Team. 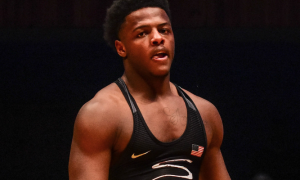 Two of the country’s rising young Greco stars, Kamal Bey (Front Range Twisters/OTC) and Jesse Porter (NYAC/NMU) delivered the much-anticipated fireworks fans in attendance were hoping to see at 74 kg. If you like points, their first in the finals series is probably one you’re going to want to go back and watch. Big throws on and off the edge were the order of the day for both wrestlers. It was an “answer back” match; Porter would try to nail something huge and then Bey would respond with his own offense. However, it was Porter who squeaked out a last-second two to take the first one 16-14. Bey was all business in the second match. 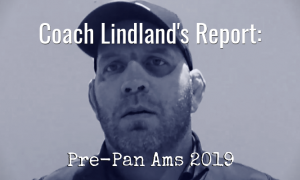 He asserted control immediately, scoring from everywhere to cruise to a 9-0 tech fall victory. The third and last bout saw Bey get off to another fast start. 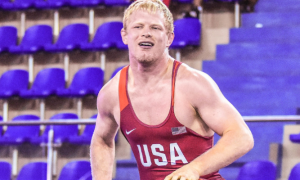 With a 7-0 lead early on, a Junior Greco World Team Trials win seemed all but certain. But Porter wasn’t going to go out without putting up a serious fight. The New York native hit a nice throw to close the gap and then picked up more points thanks to a scramble when Bey got caught underneath. However, Bey got back on track and increased his output to come away with an exciting 11-7 series-clinching win. Bey would also later be named the tournament’s Outstanding Wrestler. G’Angelo Hancock keeps rising. Hancock (Front Range Twisters/OTC), 18, made his first US Senior National team earlier this past year and also finished an impressive third at the US Olympic Trials. Showing off a keen understanding for where the offense needs to be as well as an innate ability when to try something big, Hancock demonstrated once again why he is someone to take seriously at any level. In the 96 kg final, Hancock squared off against former Cadet World Team member Angus Arthur, a Northern Michigan product who is also the holder of a bright future. Nevertheless, this was the “Hancock Show” from the outset. Utilizing a neat throw-and-turn sequence without losing his momentum, G’Angelo Hancock blitzed through the first match 10-0. He picked up where he left off going into the second of the series, again starching Arthur, this time via an 8-0 score.